When I think of the Fourth of July, I think of fireworks, summertime, hanging out, swimming, sparklers and freedom. However, a day full of celebrating freedom with friends and family wouldn't be complete without tasty food! Start off the day with a cup of coffee and a scone and end it with a savory bite of Hawaiian bbq salmon burger (with coconut caramelized pineapple, yum!). These recipes are sure to make your Fourth of July flavorful and festive. Whisk together flour, sugar, salt, and baking powder in a large mixing bowl. Grate in the butter. Stir till coated. In a small bowl, whisk together the eggs, vanilla, almond extract, and milk. Add to dry ingredients and lightly stir till ingredients are barely mixed. Fold in the berries and chocolate chips. Divide dough in half. Press each half into a 5″ circle on a lightly floured surface. Cut into 6 wedges. Place each wedge on a lightly greased cookie sheet. Place in freezer while oven is preheating to 425 degrees. 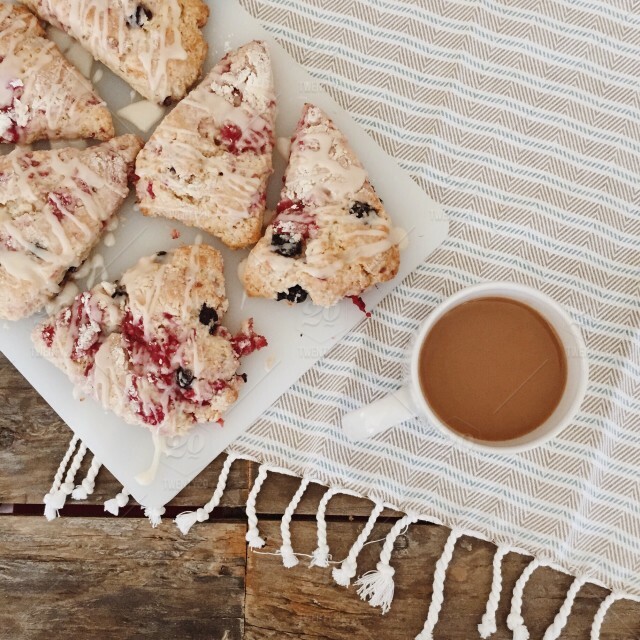 Brush tops of scones with milk and sprinkle with sugar. Bake for about 18 minutes at 425°. Makes 12 scones. 1. Brine: Whisk together water, soy sauce, sugar and salt in a large bowl until solids are completely dissolved. Place chicken breast in brine and refrigerate for 45 minutes. Remove chicken from brine and pat dry with paper towels. 2. Chicken: Cut chicken into 1-inch cubes. Wrap each piece of chicken with ½ a slice of bacon. Thread bacon-wrapped chicken on skewers, alternating with pineapple cubes. 3. Light one chimney full of charcoal. When all the charcoal is lit and covered with gray ash, pour out and spread the coals evenly over entire surface of coal grate. Set cooking grate in place, cover grill and allow to preheat for 5 minutes. Clean and oil the grilling grate. Grill skewers until bacon has browned and crisped and chicken has cooked through, 3-4 minutes per side. In the last minute of cooking, brush each skewer with teriyaki sauce all over. Remove to a platter, let rest for 5 minutes, then serve immediately with remaining teriyaki sauce. 3. Leave them in the freezer for about 2 hours. Then they’re ready to eat!